1964: Wilderness Act, setting aside nearly 9 million acres for protection. To date, Congress has designated more than 106 million acres of public lands as wilderness. 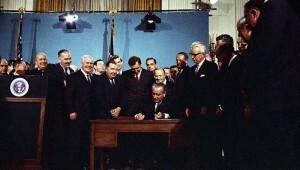 1970: National Environmental Policy Act, requiring the government to assess the environmental impact of federal projects. 1972: Clean Water Act, a means of reducing the discharge of pollutants into waterways. 1973: Endangered Species Act, to recover imperiled species and protect their habitats.